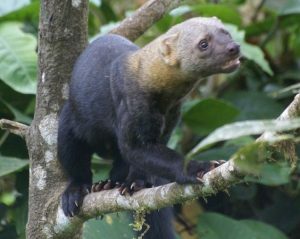 The Tayra – a powerful and playful animal. When I studied Tai-chi-Chuan with Grandmaster William Chen I was a zoologist. One of my jobs was to import animals from around the world for captive breeding programs. Most of my time was spent working with hundreds of species of animals. They were often much stronger and quicker than I and were sometimes in a bad mood. I had to learn the dynamics of their movements, attention and their body energy to survive day to day. There was something they all did that took me a while to understand. That dynamic is the basis of what I teach in the Tai-chi exercise of “push hands”. This makes my push hands different from that of other teachers. We talk about “energy” in Tai-chi. The animals were doing something with that energy. In most push hands interactions you will see each partner trying to keep the other partner away from them. Hands are flying and each tries to impose their force on the other. In some cases a partner may be mechanically well grounded and very fast and so it goes well for him. Their attention is always on counteracting the partner and imposing their will. The animals were doing something very different. They were extending their energy into me, and allowing my energy to enter them. They were certainly not trying to “keep me away” in the normal push hands sense. Yet they were very powerful and I could do nothing with them – until I learned their method. When I watch push hands competitions, my main interest is in the “orientation” of the joints of the body. If each joint was an arrow, pointing in the direction of its energy, to which direction would the arrow be pointing? What I see in most push hands is that the orientation is downward into the partner. It is as if each partner is falling onto the other. When I worked with the animals, the orientation of each of their joints was upwards, in an approximately 45 degree angle. In addition, they seemed to absorb my force, which in turn, was fed back to me. With further study, I found that they were absorbing my force into their ligaments and tendons, which they used like a bowstring. My own force, stored in their bodies, was then released back into me. My degree in “ethology” (the evolution of animal behavior) came in handy, as I had learned how to study animal behavior in a systematic way. My training in Tai-chi-Chuan, including push hands, gave me another approach to understanding this behavior, that of thinking in terms of energy flow. I realized that they were manipulating my energy within their bodies, and their energy within my body to control me. We became in essence, a single energetic system and their attention was at the center of that system. Mine was not. It was only on my side. Furthermore, they could place the fulcrum of interaction at any point that was must beneficial for them. The fulcrum in this case, refers to the reference point their joints use to pivot around. For example, I can move my body pivoting around my tai-tien (about an inch and a half below the navel at the center of the body) or around my sternum. Just by placing my concentration at such a point, the joints function with that point as their reference. As I fought or played with the animal (depending on its disposition), it could constantly change that fulcrum point which confused the heck out of me. Tayras and grisons were my favorite. These Central and South American weasel-like mammals are about eight to fifteen pounds. They are like little wolverines. There were many species of cats, monkeys, honey bears, coati mundis, anteaters, as well as pythons up to thirteen feet, monitor (dragon) lizards up to eight feet long, many birds and others. Each had its own way of using energy and I had to learn them all. When I practiced push hands with the other students, I would use these methods of using energy, and push hands became more fun than competition. Many of the animals could throw me off just by using their breath and I brought this into class. When I learned something in class, I brought it back to the animals. Eventually, the animals all learned to do push hands with me and their moods were always good. So now when I teach push hands to my students, I substitute for the animals, using one dynamic in one class and another dynamic another day. When I still had the animal importing set-up, I used to bring the animals themselves into class. Now I just bring in the energy so my students can get a similar experience. I found dozens of energy dynamics in the many species and integrated them into what Grandmaster Chen taught me. Today my push hands is not so much about how many times a student can push over another student to get points. It is about learning these energy dynamics, which can then be used in everyday life. These dynamics don’t necessarily require physical contact. They can be done even in a verbal interaction, because there are always energy dynamics going on underneath. My students regularly tell me how they used a particular dynamic in an interaction, often at work. Translating push hands dynamics into everyday life is the greatest benefit of this exercise. It is also humbling to realize that animals are so much smarter in certain ways, than people.